(2008) Sponsored by UNICEF, Chennai – Nalamdana toured over ten villages in the Krishnagiri District of Tamil Nadu during September and October 2008. Special drama’s on basic sanitation, hand washing, use of toilets and proper storage and use of water have been the key messages conveyed through a new drama. 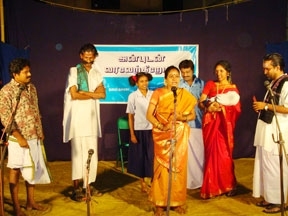 Theatre training and workshops for local youth were planned under this project.